What games do you play on your PDA - Solitaire? Blackjack? 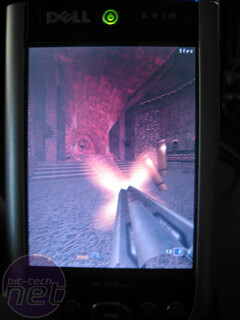 Why not make your PSP-playing mates jealous by whipping out your Dell Axim X51v and firing up Quake III Arena? That's right: less than six years after it was the flagship PC FPS game (though never as pretty as Unreal Tournament), Quake III Arena is now available to be played on your pocket-sized PDA. How is that possible? To explain it, first, we need to take a walk down memory lane. If you are old school enough, you will remember that years before ATI vs NVIDIA, the battle for the 3D graphics card market was between 3DFX (of Voodoo fame) and a small company based in Kings Langley, England called Videologic. Their PowerVR graphics technology powered the Sega Dreamcast and the powerful Sega NAOMI arcade machines. PowerVR took a revolutionary approach to rendering 3D graphics, employing an elegant (and super efficient) Tile-Based Renderer rather than 3DFX's brute-force triangle engine. Sadly, PowerVR could not compete with the raw speed of their 3DFX (and later NVIDIA) rivals, and the Dreamcast ultimately failed, despite offering superior visuals to the PlayStation 2 that launched a full year later. To their credit, the boffins at Videologic (now Imagination Technologies) continued the development of PowerVR, and adapted it to mobile devices, where its high efficiency means you can extract a lot of raw speed out of a very low-power core. They signed licensing deals with the like of Intel, and their graphics know-how is now embedded in mobile phones, PDAs, set-top boxes and other integrated systems like video-poker machines. Christien Rioux of NoctemWare has ported the recently-GPL-released Quake III Arena from id Software to Windows CE 4.2 for Pocket PC, utilising its SpeedDemon Windows CE profiler. The latest version (Q3CE v1.1) includes direct support for hardware acceleration through OpenGL ES for the PowerVR-enabled Dell Axim x50v/x51v. Q3CE is currently achieving up to 25 fps on the Dell Axim X50v, and is &quot;totally playable&quot; on the 3.7-inch 640x480 colour TFT screen. 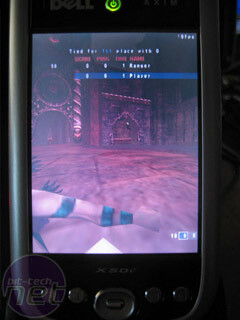 Quake III Arena at a &quot;totally playable&quot; 25 fps on the PowerVR-powered Dell Axim X50v PDA. Quake Mobile takes all of the action, levels, weapons, and bad guys from the original PC title and transforms it all into the fastest, smoothest and most intense game ever to reach the Pocket PC. Quake Mobile takes advantage of PowerVR 3D graphics acceleration hardware technology to ensure the best possible graphics. &quot;It's the first mobile game to replicate a three-dimensional PC experience almost flawlessly&quot;, wrote Avery Score on GameSpot Mobile. 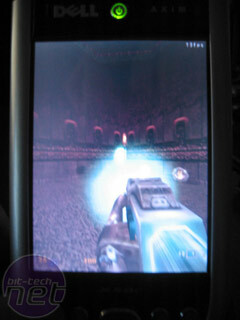 Gamespot awarded Quake Mobile as Best Mobile Game of E3 2005. Do you have a burning desire to play games with top 3D graphics on your PDA / phone or is this 'digital convergence' gone mad? Debate the pros & cons of mobile gaming in our Discussion Forums. GPU efforts may finally be ready. Looks to shift Pure, too. New quad-thread MIPS chip included.